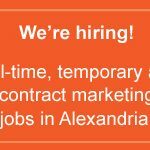 New to Washington, DC and Need a Marketing Job? We’re TorchLight, one of the DC region’s top marketing communications headhunters, and we want to meet you! We represent some of the Capital area’s most successful, growing companies–from for-profit and nonprofit to start-ups and trade associations–and our clients may be looking for someone just like you. Our clients are looking to fill a variety of full-time, part-time, temporary and short-term marketing positions. Ready for a new opportunity in marketing, communications or public relations? Send us your resume. DC’s top companies are hiring right now! Whether you’re new to the Washington area and seeking employment or whether you’re a seasoned marketing expert ready for that next career challenge, start your marketing job search with TorchLight. TorchLight marketing recruiters are looking for candidates like you! Are you an experienced professional in Washington, Northern Virginia or Maryland seeking an exciting new marketing, communications or PR job opportunity? Look no further!